* Artiodactyla on Mammal species of the World. Don E. Wilson & DeeAnn M. Reeder (editors). 2005. Mammal Species of the World : A Taxonomic and Geographic Reference, 2-volume set (3rd ed). The even-toed ungulates form the mammal order Artiodactyla (artios even + daktulos toe), the group that contains the pigs, peccaries, hippopotamuses, camels, chevrotains (mouse deer), deer, giraffes, pronghorn, antelopes, sheep, goats, and cattle. They are ungulates whose weight is borne about equally by the third and fourth toes, rather than mostly or entirely by the third as in odd-toed ungulates (perissodactyls). Another key distinguishing feature is the shape of the astragalus, a bone in the ankle joint, which has a double-pulley structure. This gives the foot greater flexibility. DNA sequence data indicate that this group is paraphyletic because whales are excluded. The more phylogenetically accurate group is Cetartiodactyla. There are about 220 artiodactyl species, including many that are of great nutritional, economic and cultural importance to humans. The appearance of grasses during the Eocene and their subsequent spread during the Miocene (about 20 million years ago) saw a major change: grasses are very difficult to eat and the even-toed ungulates with their highly-developed stomachs were better able to adapt to this coarse, low-nutrition diet, and soon replaced the odd-toed ungulates as the dominant terrestrial herbivores. Now-extinct Artiodactyla which developed during the Miocene include the species Ampelomeryx, Tauromeryx, Triceromeryx, and others. The following classification uses systematics laid out by McKenna and Bell in 1997, and the extant families recognised by Mammal Species of the World published in 2005. Currently the cetaceans and even-toed ungulates have been placed in Cetartiodactyla as sister groups, although DNA analysis has shown cetaceans evolved from within Artiodactyla. The most recent theory into the origins of hippopotamidae suggests that hippos and whales shared a common semi-aquatic ancestor that branched off from other artiodactyls around 60 million years ago. This hypothesized ancestral group likely split into two branches around 54 million years ago. One branch would evolve into cetaceans, possibly beginning with the proto-whale Pakicetus from 52 million years ago with other early whale ancestors collectively known as Archaeoceti, which eventually underwent aquatic adaptation into the completely aquatic cetaceans. (*) Cetancodonta contains the order Cetacea as well. As a result, its inclusion in the above list actually makes the clade Artiodactyla paraphyletic. Strictly speaking, the Cetancodonta are a subclade of the superorder Cetartiodactyla. By treating the Cetancodonta accordingly, both Artiodactyla and Cetartiodactyla will remain monophyletic. The even-toed ungulates stand on an even number of toes; the group's four suborders differ in other characteristics. Suina (pigs and peccaries) have retained four toes of fairly equal size, have simpler molars, short legs, and often have enlarged canine teeth that form tusks. Camelids and Ruminantia tend to be longer-legged, to walk on only the central two toes (though the outer two may survive as rarely-used dew-claws) and to have more complex cheek teeth well-suited to grinding up tough grasses. The ancestors of the even-toed ungulates were omnivores that preferred plant material; now even-toed ungulates are generally herbivorous, although species in the suborder Suina (pigs and peccaries) are, like their primitive ancestors, omnivores. Larger stomachs and longer intestines have evolved because plant food is less easily digested than meat. Tylopoda (camels, llamas and alpacas) and the chevrotains have a three-chambered stomach while the rest of Ruminantia have four-chambered stomachs. The handicap of a heavy digestive system has increased selective pressure for limb bone adaptations to escape predators. Most species within Suina have a simple two-chambered stomach that allows an omnivorous diet, the babirusa, however, is a herbivore. They have extra maxillary teeth to allow proper mastication of plant material. Most of the fermentation occurs in the caecum with the help of cellulolytic microorganisms. Peccaries however have a complex stomach that contains four compartments. Microbial fermentation with the formation of high volatile fatty acid levels has been observed in the fore stomach, it has been proposed that their complex fore stomach is a means to slow digestive passage and increase digestive efficiency. Hippopotamuses have a three-chambered stomach and do not ruminate, they consume grass during the night and may cover large distances (up to 20 miles) to feed. They eat around 68 kg of food each night, also relying on microbes to break down plant material with cellulase. Rumination occurs in the ruminants (Ruminantia and Tylopoda), whereby food is regurgitated and rechewed then broken down by microbes in the stomach. After ingestion of plant material it is mixed with saliva in the rumen and reticulum and separates into layers of solid and liquid material. The solids lump together to form a bolus (also known as the cud), this is regurgitated by reticular contractions while the glottis is closed. When the bolus enters the mouth, the fluid is squeezed out with the tongue and reswallowed. The bolus is chewed slowly to completely mix it with saliva and to break down the particle size. Ingested food passes to the 'fermentation chamber' (rumen and reticulum) where it is kept in continual motion by rhythmic contractions of this organ. Cellulytic microbes (bacteria, protozoa, and fungi) produce cellulase, which is needed to break down the cellulose found in plant material. Without this mutual symbiosis ruminants would find plant material indigestible. Even-toed ungulates are found on every continent but Antarctica; they were introduced to Australia and New Zealand by humans. The even-toed ungulates are of more economic and cultural benefit than any other group of mammals. There is clear evidence of antelopes being used for food 2 million years ago in the Olduvai Gorge, part of the Great Rift Valley. Cro-Magnons relied heavily on reindeer for food, skins, tools and weapons; with dropping temperatures and increased reindeer numbers at the end of the Pleistocene, they became the prey of choice. By around 12,500 years ago, reindeer remains accounted for 94 percent of bones and teeth found in a cave above the Céou River. Cattle today are the basis of a multi-billion dollar industry worldwide. The international trade in beef for 2000 was over $30 billion and represented only 23 percent of world beef production. Artiodactyl is Greek, from ἄρτιος, ártios, "even", and δάκτυλος, dáktylos, "finger/toe", so the name is a translation of the description "even-toed". 1. ^ Savage, R. J. G. & Long, M. R. (1986). Mammal Evolution: an illustrated guide. New York: Facts on File. pp. 208. ISBN 0-8160-1194-X. 2. ^ McKenna, M. C. & Bell, S. K. (1997). Classification of Mammals Above the Species Level. New York: Columbia University Press. ISBN 0-231-11013-8. 3. ^ Wilson, D. E. & Reeder, D. M., ed (2005). Mammal Species of the World (3rd ed.). Johns Hopkins University Press. pp. 111–184. ISBN 0-801-88221-4. 4. ^ "Scientists find missing link between the dolphin, whale and its closest relative, the hippo". Science News Daily. 2005-01-25. http://www.sciencenewsdaily.org/story-2806.html. Retrieved 2007-06-18. 5. ^ Gatesy, J. (1 May 1997). "More DNA support for a Cetacea/Hippopotamidae clade: the blood-clotting protein gene gamma-fibrinogen". Molecular Biology and Evolution 14 (5): 537–543. PMID 9159931. http://mbe.oxfordjournals.org/cgi/content/abstract/14/5/537. 6. ^ Ursing, B. M.; Arnason, U. (1998). "Analyses of mitochondrial genomes strongly support a hippopotamus-whale clade". Proceedings of the Royal Society 265 (1412): 2251. doi:10.1098/rspb.1998.0567. 7. ^ Boisserie, Jean-Renaud; Lihoreau, F. & Brunet, M. (February 2005). "The position of Hippopotamidae within Cetartiodactyla". Proceedings of the National Academy of Sciences 102 (5): 1537–1541. doi:10.1073/pnas.0409518102. PMID 15677331. PMC 547867. http://www.pnas.org/cgi/content/full/102/5/1537. Retrieved 2007-06-09. 8. ^ a b c d "Artiodactyl". Encyclopædia Britannica Online. Encyclopædia Britannica, Inc.. 2008. http://www.britannica.com/EBchecked/topic/37203/artiodactyl. Retrieved 2008-10-17. 9. ^ a b Janis, C. & Jarman, P. (1984). Macdonald, D.. ed. The Encyclopedia of Mammals. New York: Facts on File. pp. 498–499. ISBN 0-87196-871-1. 10. ^ a b Shively, C. L. et al. (1985). "Some Aspects of the Nutritional Biology of the Collared Peccary". The Journal of Wildlife Management 49 (3): 729–732. doi:10.2307/3801702. 11. ^ Pough, F. W., Janis, C. M. & Heiser, J. B. (2005) . 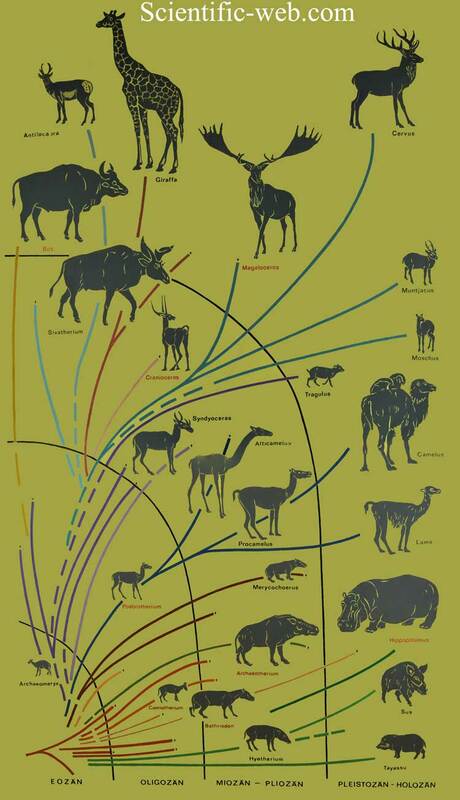 "Major Lineages of Mammals". Vertebrate Life (7th ed.). Pearson. pp. 539. ISBN 0-13-127836-3. 12. ^ "Bones From French Cave Show Neanderthals, Cro-Magnon Hunted Same Prey". ScienceDaily. 2003. http://www.sciencedaily.com/releases/2003/09/030923065212.htm. Retrieved 2008-10-17. 13. ^ Clay, J. (2004). World Agriculture and the Environment: A Commodity-by-Commodity Guide to Impacts and Practices. Washington, D.C., USA: Island Press. ISBN 1559633700.